This is the third in our series of posts on chroma key compositing. 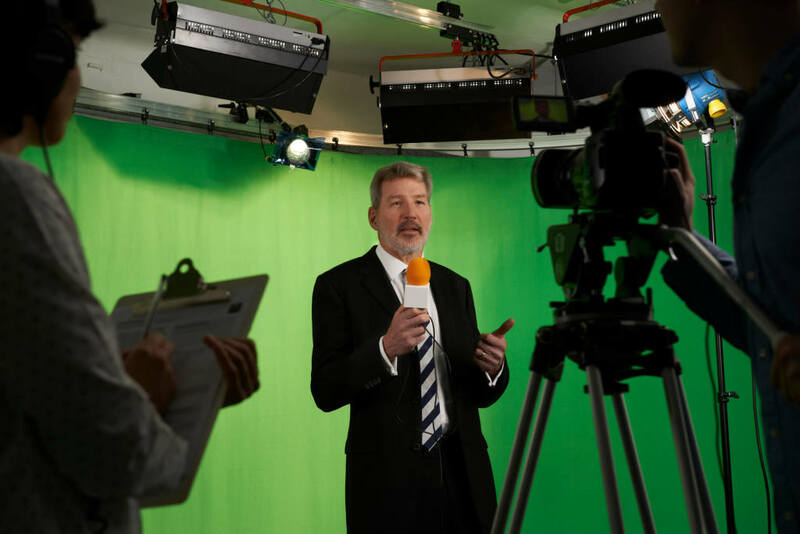 We’ve explored what chroma key is–a way of shooting a video before a blank blue or green screen background and then replacing that screen with another background. We’ve discussed the differences between using a green screen and a blue screen, and how to use the technique in terms of camera work and lighting. As those previous articles show, chroma key compositing can be useful for all kinds of broadcasts, including when you want to stream live video on your website directly via an online video platform. Now let’s go to the other end: the encoding software, and chroma key functions thereof. The focus here will be on using chroma key software in conjunction with other streaming solutions. Although the technique was developed initially for canned video — actually it first emerged in the days of analog film photography, before digital — today’s live broadcast software allows you to use chroma key with live streaming as well. The most popular encoding software, Adobe Flash Media Live Encoder, unfortunately lacks this capacity and probably won’t acquire it. Adobe FMLE is a free software and last updated in 2009. Five other RTMP software encoders do have it: Wirecast, vMix, VidBlaster, Open Broadcaster Software (OBS), and Xsplit. All of these have controls and options that let you use chroma key, and all of them are very easy to use. 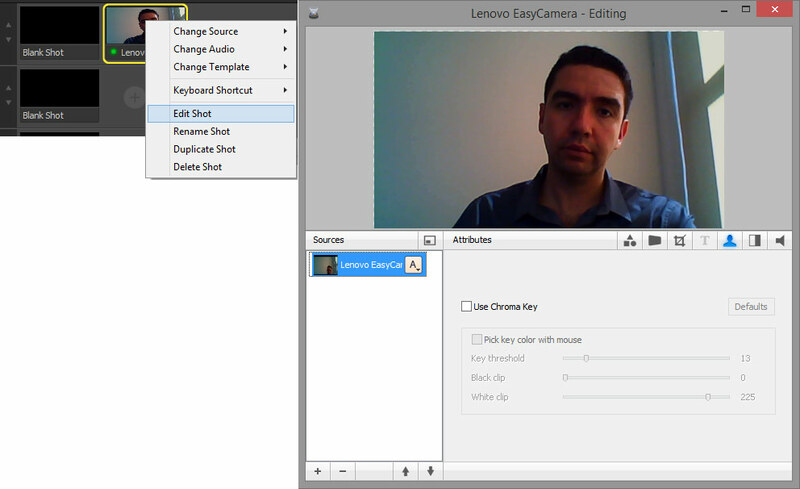 With Wirecast, chroma key processing is done in the shot editor, and can be done in the course of a live broadcast. To access the editor, right click the camera source and go to “Edit Shot”. From the editor menu, click on the chroma key attributes button, the icon of which looks like a person. 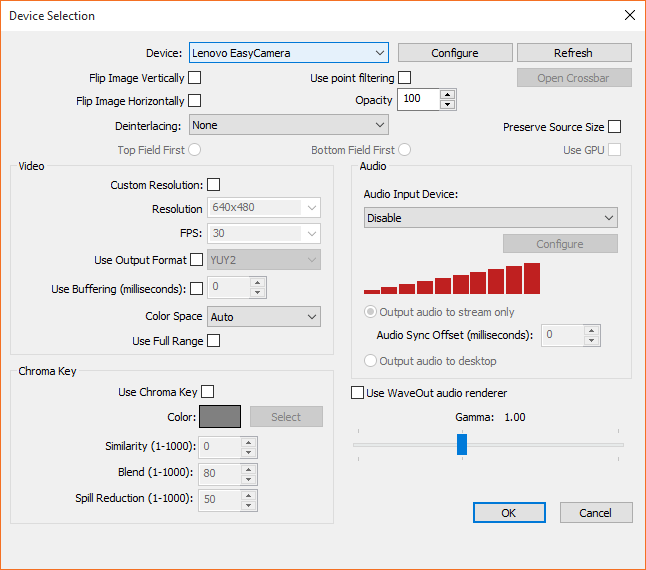 This opens a submenu that allows you to add either a still photo or a live video stream as replacement for the chroma key screen. To make things a little more interesting, Wirecast offers a set of virtual templates that let you incorporate your background stream into a predesigned setup for common streaming purposes. These templates add a closer foreground in some cases, so that the person in your video looks as if he’s seated behind a desk or podium. Each template has several layers to it, adding complexity to the simple chroma key process. After setting up the shot the way you want, click “Go” and you’re broadcasting live. These features are available with Wirecast 4 and later editions. VMix requires a little more hands-on fiddling than Wirecast, but it still isn’t difficult to use. From the main screen, you can see small windows below the main view. Select “Add Input” for the left-hand window and add your foreground video stream. This should include the green or blue screen background, which now appears in that window. Double-click the image to bring up a set of option, and choose “Colour Key.” Click the eye-dropper icon and then click on the pop-up version of the image to select the exact color from somewhere on the screen (which should all be the same color if you’ve set up your screen photography correctly). Clicking the “Auto Chroma Key” button thereafter automatically removes the screen, replacing it with a black background. Fine-tuning controls are available if the program’s automatic functions don’t give an optimum result. Click the add input button again and select a background image or stream, or one of the built in virtual sets vMix provides. These work much like the templates in Wirecast (see above). Once the background is configured, click the Set Up button and choose what goes into each layer of the combined video stream. Your foreground video goes into the “Talent” layer. You can then choose camera angles, zoom, and other features. 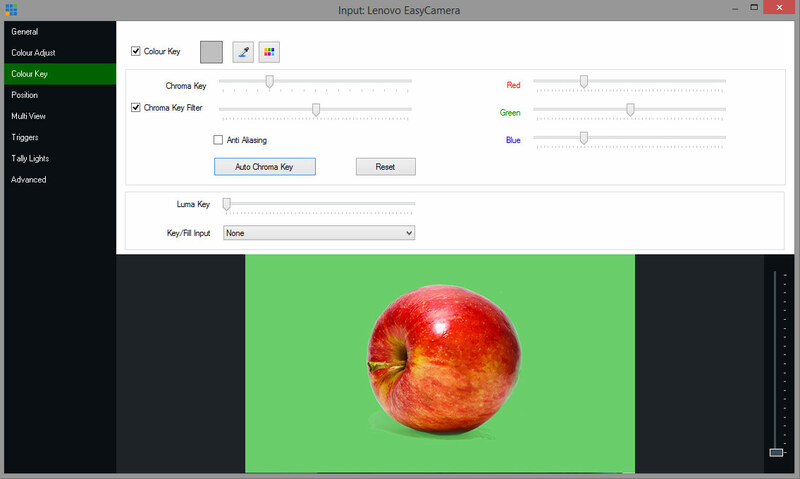 With VidBlaster, chroma key is handled by adding an effect module. Click the “Module” pull-down menu and select “Add,” then choose “Effect” from the pop-up menu. This opens the effect module box with several drop-down menus of its own. From the top one, select “Chroma key,” which should be the first option. The left menu box allows you to select the foreground camera source, and the right box lets you select the background source. This can be another camera, a still photo, a program, a blank white screen, and several other options. In the more advanced versions of VidBlaster, right-clicking the background image brings up an advanced setting menu. Most users of this program will advise setting the similarity quite high, at least 800, but we’ve seen contrary advice saying that if you handle your physical screen and video shooting well, you shouldn’t need to go much above 100. Also, most people recommend not using the “eye dropper” method as described above for vMix. Once you have the chroma key working as desired, set up your background as a second source and preview to make sure it looks the way you want. Xsplit is designed with video game broadcasting in mind, so its chroma key elements are well suited to placing an image into game footage. However, this software is also adaptable for other uses of chroma key. Set up your layers so that your foreground stream is a higher layer than your background stream. In Xsplit, you can use the source lit in the lower left corner of the screen. With your two sources positioned and assigned layer priority, right-click on the foreground stream to bring up a menu, and click the “Color” tab. Click the radio button to activate chroma key. This brings up a submenu that lets you set the key color, the “threshold” (identical to “similarity” in OBS), and several other tweaks. 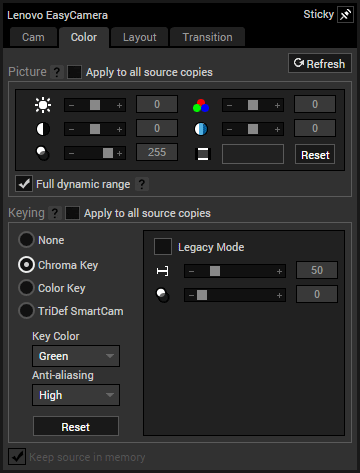 Regardless of what encoding software you’re using, chroma key isn’t hard to set up and requires only a few clicks and option choices. Each program has its own terminology and specific way of getting there, but all of them are fairly easy to use. The tricky part of using chroma key stems primarily from the physical setup and photography itself. We’ll delve into those topics in more detail in future posts. For regular tips on live streaming, as well as exclusive offers, you can join our LinkedIn group. To start streaming live with DaCast today, you can take advantage of our 30-day free trial (no credit card required). Just click the button below to start streaming live today! Any opinion on which solution offers the cleanest key? I’ve played around with Wirecast several times but was never too impressed with the results compared to what I can get in post. Are any of the others better, or are they all about the same? That’s an excellent question, we were actually considering doing either a blog or video (or both) around this very topic of seeing how the various encoders performed against one another for chroma key. It’s nice to see feedback that this is indeed something people are interested in learning more about, so do expect a detailed analysis on this in the future. Sounds great. I look forward to it. I’ve read a lot of the blog posts here and find several of them useful. I should comment more often. Dacast is an awesome platform and awesome for creating these posts. Thanks for the strong praise, we deeply appreciate it! Thank you reading us Curtis! In this article, we do talk about Open Broadcasting Software (OBS). It is the most effective and well-known Open Source Encoder and it is free. Many of our customers use it daily with no problems. I personally use that one too on a Early 2013 laptop and I never faced any issue, CPU or not. Adobe’s FMLE is also a good free solution. We are always willing to try solutions. How do I apply a 3d chroma key effect? Such that when there is a zoom on the broadcaster, the background view zooms-in in a realistic way. Are there softwares available for this kind of effect? Thank you very much for the sophisticated answer and all the important informations you are providing to our readers!